One day until the state election. They do great work, and it’s rather good to see the ABC’s Fact Check unit looking at Victorian issues just before the election. The claim: Denis Napthine says his Government has “improved train punctuality”. The verdict: With punctuality running at over 92 per cent across the Metro network, trains are more often on time now than under the previous Labor government. They looked at the statistics, and they also considered stop skipping, which figures indicate is done on less than half of 1% of services — not enough to greatly influence the result, though sometimes done to excess. But as commenters on their web site have noted, they didn’t look at the other factor: timetable padding. 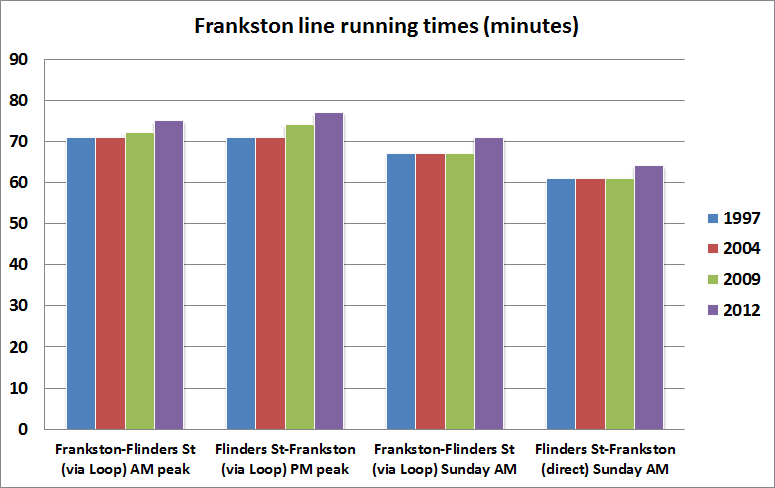 Comparing times on the Frankston line: during peak (morning inbound, afternoon outbound), and when it’s quiter (Sunday morning inbound and outbound), we can clearly see that running times have increased — 3-4 minutes was added in 2012. It’s a similar story on other lines. Is padding the timetable always bad? No. If network congestion or loadings are such that trains can never achieve the timetable, then allowing more time would be justified. But in some cases there is now so much padding (for instance, Hawksburn to South Yarra now allows 4 minutes in peak; Richmond to Flinders Street direct allows up to 7) that trains regularly sit idle at stations waiting for the timetable to catch up… or (accidentally) depart before their scheduled time. So it’s hardly surprising that punctuality has increased. They also haven’t mentioned Loop bypasses, which are a particular problem for the Altona Loop (perhaps thankfully the only suburban section they can do it on) but also the City Loop. These count as a partial cancellation, but when they happen they improve punctuality stats. Additionally it’s notable that the government always talks about punctuality, not cancellations, because the latter has barely changed. That’s outside the scope of ABC Factcheck though; they look at what is claimed, not what isn’t. See also: Alan Davies at Crikey: Did the ABC fact checkers get it right on train punctuality? A little while ago I bought myself the Collected Shaun Micallef — a box set of numerous shows of his, including The Micallef P(r)ogram(me). The kids and I have been watching our way through it. 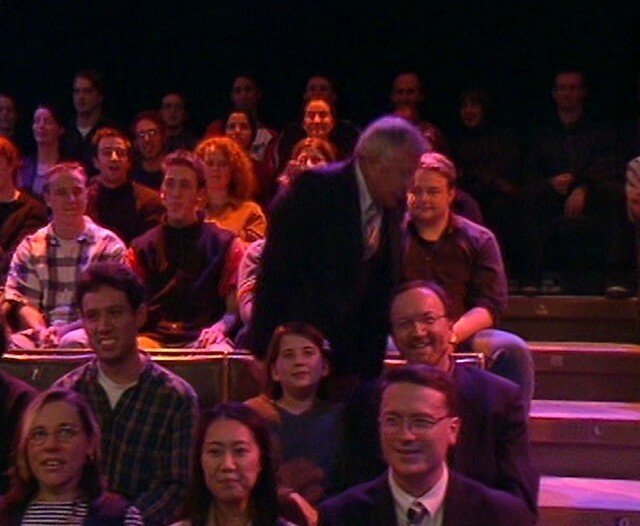 I remembered that I had gone to a recording of the show, but had no idea which episode it was. The other night it became very obvious that it had been the final episode of season 2 — in a sketch parodying The Price Is Right, there I was, in the audience. Coincidentally last night we went to a recording of one of Shaun’s current series — Mad As Hell. We arrived about 5pm, and around half-an-hour later were let into a waiting area, then into the studio itself, with recording starting at about 6pm. 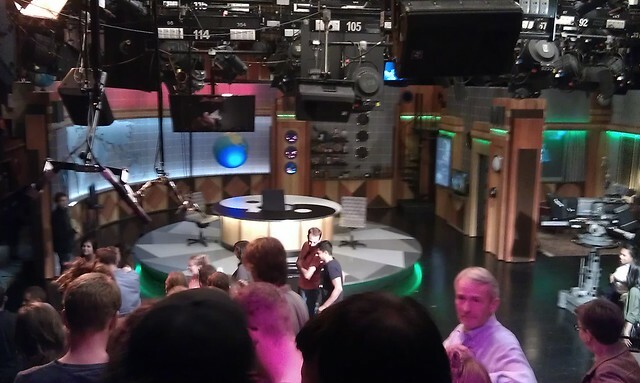 With stops and starts and gaffs aplenty, it took until about 8pm to record the half-hour show. Most unintentionally amusing moment: after numerous warnings to go to the toilet before recording started, the warm-up guy asked if there were any final questions before beginning, only to be faced with one gentleman piping up: “Is there time to urinate?” — he was whisked off to do so. Best moment you won’t see on-screen: an audience member who is a musician from Morocco (who has just emigrated) being invited onto stage to play a guitar they’d found. He played a North African song which (if I got this right) is about a bloke who pays a dowry for a wife but is dudded by the father (who has dudded many suitors) and ends up alone. 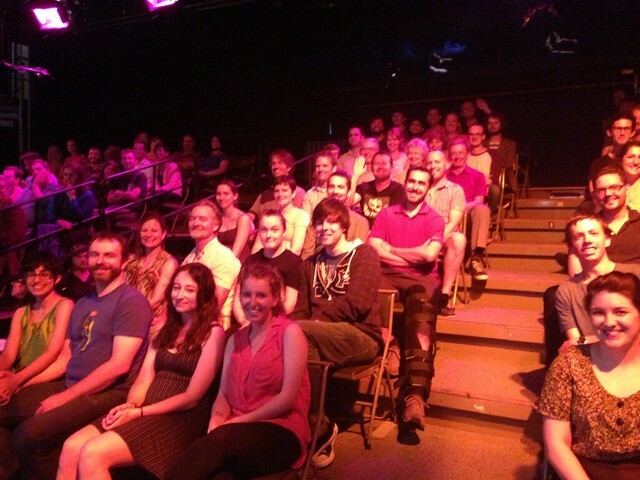 I don’t think there were any shots of the audience filmed for the show, but the warm-up guy took a photo of part of the audience. I’m up the back, a blurry blob in the dark, waving. Lots of fun… apparently they still need audiences for later in the season. 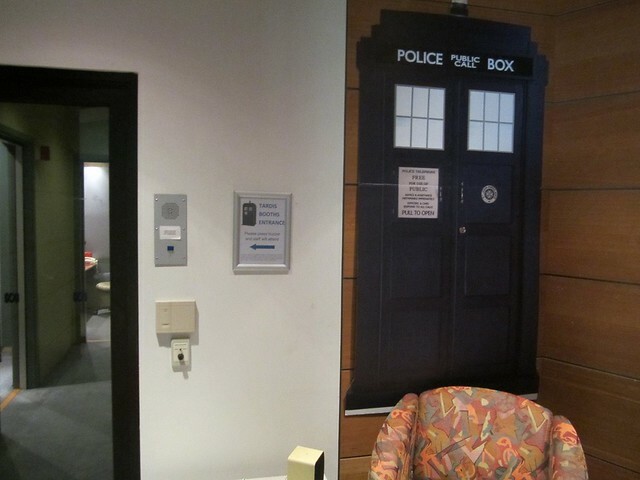 …there is a Triple J studio called “TARDIS”. Well, recording booths. I discovered that they’re not bigger on the inside. I was there the other day at lunchtime. My blabbering has shown up as part of a Triple J “Hack” story on the costs of public transport vs cars. 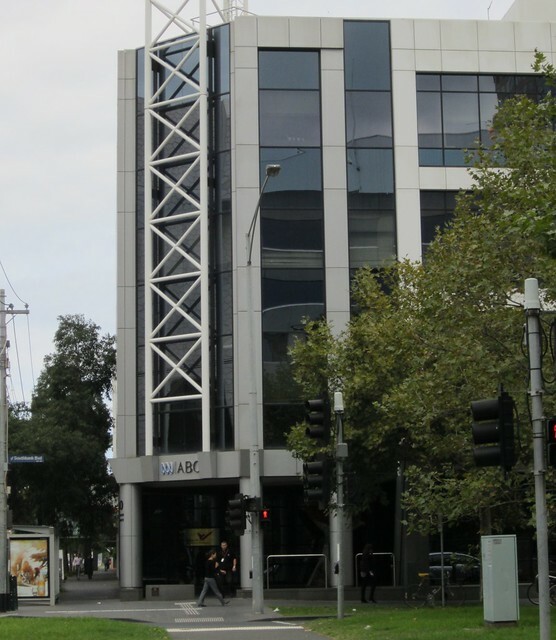 ABC News 24 was the first HD-only channel. There’s more on the way: Channel 7’s offering aimed at the male demographic “7-Mate” will also be HD-only. Channel 10’s new “Eleven” will be SD, but it will replace the SD version of their sports channel “One”. There are rumours Channel 9 will launch a new channel next year, and inevitably that’ll be HD-only, given they have to continue to broadcast their main channel in SD. Time, perhaps, for those of you with no HD tuner to look into upgrading. Once the commercial networks launch their third channels, by my calculations we’ll almost be at capacity, with 15, though it’s unclear to me if SBS has the right to put up any more channels. Certainly things have grown since just a few years ago when there were 6 (analogue) channels: ABC, 7, 9, 10, SBS and Channel 31. Note the graph is not linear. Based on some stuff from Wikipedia, counting distinct programming, and main channels only, not things like channels displaying TV guides, which were used at one time last decade. I may have missed a few minor and temporary ones, like that 3D test channel that ran for a while this year. That bump in 2001-03 was the ABC’s initial extra channels FlyTV and ABC Kids, both of which got canned. 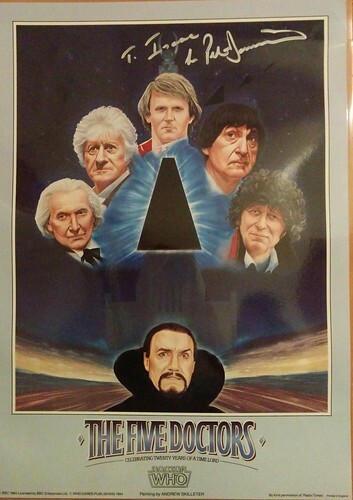 Ian, an Englishman used to the old UK channel numbering of BBC1, BBC2, ITV (implied “3”), Channel 4, Channel 5 etc, once remarked to me that when they first discovered Australia had a “Channel 10”, they wondered if we also had channels 1 to 9. We didn’t of course, but now we do, though they’re not all numbered like that. (In the mean time of course, the UK has also expanded its channel range via digital… and interestingly, the BBC’s “CBeebies” and “CBBC” are similar to the ABC2 and ABC3 daytime children target demographics. How many people are watching what? Despite glitches like those that affected Sunday night’s repeat of Insiders (where it started late, accidently switched to Inside Business for a mistaken minute or two, then flicked back but was cut short just as Barrie Cassidy made an interesting point), I’m very much enjoying ABC News 24. This interesting piece highlights something that hadn’t occurred to me: because it covers major press conferences live and unedited, it’s proving a boon for niche journalists, such as the tech press, who are covering the debate over broadband, as they can’t afford to physically be at these press conferences, but can listen in via the TV coverage. And of course their readers, who can also watch the coverage for themselves.